All the right elements come together to make Antalya, a Mediterranean town 240 mi/385 km southwest of Ankara, one of Turkey's top attractions. Not only is Antalya—part of the so-called Turkish Riviera—on a beautiful crescent bay with some of the best snorkeling in Turkey, but dramatic cliffs and the Toros Mountains also contribute to one of the most beautiful backdrops on the Mediterranean. Antalya (once known as Antioch) is the most popular port destination in Turkey. Antalya offers variety, too: Visitors can take a break from the sea and sand to visit Hittite, Greek and Roman ruins right in town, or take day trips to enjoy both natural and historic attractions. The beaches near town are pebbly; the ones farther out are much softer. Natural attractions near Antalya include the Manavgat Waterfalls, Upper and Lower Duden Waterfalls, Kadinyari Cliff, the Koprulu Canyon and the eternal flames of the Chimaera near Olympos. 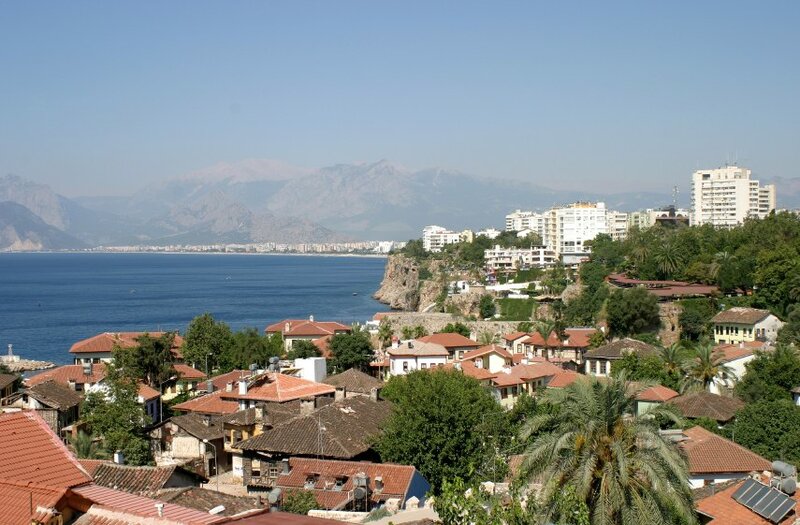 Allow at least three nights to see Antalya and its surrounding attractions.